For more than a decade, researchers at the Emory Structural Heart & Valve Center have pioneered minimally invasive procedures to treat heart disease, including landmark research on transcatheter aortic valve replacement (TAVR). The first site in Georgia to perform TAVR, Emory has completed more of these procedures than any other healthcare system in Georgia and is one of the highest volume centers nationally. The Emory Structural Heart & Valve Center team, led by interventional cardiologist Vasilis Babaliaros, MD, is welcoming two new faculty leaders, interventional cardiologist Adam Greenbaum, MD, and cardiothoracic surgeon Kendra Grubb, MD, MHA. 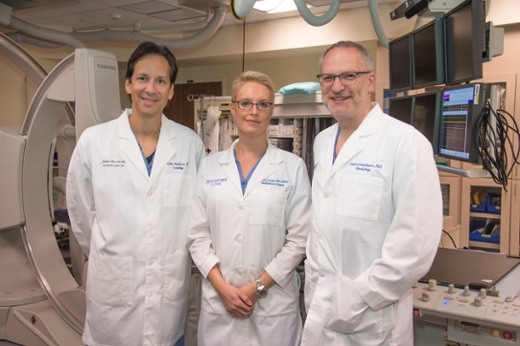 They are serving alongside Babaliaros as co-directors of the Emory Structural Heart & Valve Center, to lead the center’s multidisciplinary team of interventional cardiologists, cardiac surgeons and cardiovascular imaging specialists. “Structural heart disease threatens millions of lives around the world. 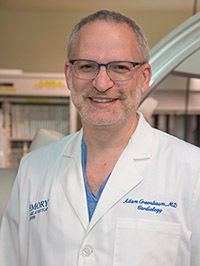 We are thrilled to welcome Dr. Grubb and Dr. Greenbaum to Emory to help us continue on our mission to develop lifesaving solutions never before imagined,” says Michael E. Halkos, MD, MSc, chief of the Division of Cardiothoracic Surgery in Emory’s Department of Surgery. “Through raw talent and innovation, these two outstanding new team members will play an integral role in our efforts to advance research and the minimally invasive treatment of structural heart disease,” says Angel Leon, MD, professor of medicine and the chief of cardiology at Emory University Hospital Midtown. Grubb is assistant professor of surgery, Division of Cardiothoracic Surgery, Emory School of Medicine and the surgical director of the Emory Structural Heart & Valve Center. 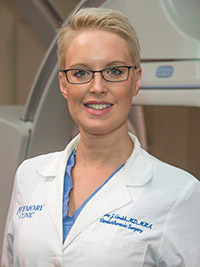 Prior to joining Emory, Grubb was director of minimally invasive cardiac surgery and the surgical director of the heart valve program at the University of Louisville. She has led and participated in multiple clinical trials of innovative cardiac surgery technologies, including studies of TAVR, MitraClip percutaneous therapy, and the GORE conformable TAG thoracic endovascular prosthesis for the primary treatment of aneurysms of the descending thoracic aorta. Grubb attended the University of Southern California, where she received her MD degree and her Master of Health Administration. She completed her general surgery residency at the University of Illinois, her fellowship in cardiothoracic surgery at the University of Virginia, and her fellowship in interventional cardiology and transcatheter therapies at New York Presbyterian/Columbia University Medical Center. 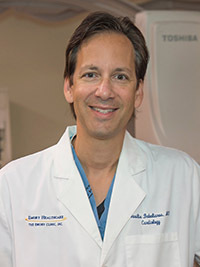 Greenbaum is an associate professor of medicine, Emory School of Medicine and co-director of the Emory Structural Heart & Valve Center. He comes to Emory from the Henry Ford Heart and Vascular Institute where he served for 19 years as co-director of the Center for Structural Heart Disease, director of the Cardiac Catheterization Laboratory and director of the Interventional Fellowship Program. Greenbaum is recognized as a clinical expert in the field of structural heart disease. He is a two-time recipient of NIH’s prestigious Orloff Science Award for his team’s work on the transcaval, LAMPOON and BASILICA heart valve replacement procedures. He is frequently called upon to teach physicians and surgeons these new techniques across the world and is highly sought after for advice on the most difficult problems and procedures by cardiologists and patients alike. His skill and care are renowned. He is board certified in general and interventional cardiology and is a Fellow of the American College of Cardiology, the American Heart Association and the Society for Cardiovascular Angiography and Interventions. Greenbaum graduated from the New York University School of Medicine. He completed internal medicine training at the University of Michigan and general and interventional cardiology training at Duke University. Emory Healthcare's comprehensive, highly-specialized, multidisciplinary Structural Heart & Valve Center is a comprehensive institution for all types of cardiac valve structural treatments including advanced imaging modalities, complex interventional and transcatheter approaches, as well as innovative and robotic surgical options. The center offers full-service locations at Emory University Hospital, Emory University Hospital Midtown and Emory Saint Joseph’s Hospital. For more information, please click here.